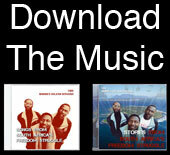 Get notified about our screenings & concerts, plus get a free Robben Island Singers MP3! Flip video shot by Groundswell intern Candyce Jones. Groundswell co-founder Jeff Spitz recently screened a rough cut of Robben Island Singers at Prosser Career Academy High School on Chicago’s West Side. Thirty-five students watched the film and then were able to ask questions to singers Muntu Nxumalo and Thembinkosi Sithole in South Africa via Skype. Students said they liked going back and forth from South Africa to the US and having a live conversation with the ex-political prisoners. They liked the “real lives” theme of the film. “Both sides liked the way that stereotypes in both countries are broken down by music, film, and international exchange,” Spitz said. Students said they appreciated the chance to see a film work-in-progress. This item was originally posted at groundswellfilms.org/news. Copyright © 2019 Groundswell Educational Films. Login. Credits. Chicago Public Relations by Amdur Spitz & Associates.